This case is not custom made for the speakers in the title. This case fits 2 speakers named in the title reasonably well. Please measure your speakers and compare the dimensions to the inside dimensions of each compartment listed here so that you know how much extra space there will be and if that is acceptable to you. Please keep in mind that extra foam pads can be used to take up any extra space. Keep your speakers safe with this economical heavy duty innovative new design 2 in 1 speaker road case. It is perfect for speakers of many models and sizes of speakers on the market today. 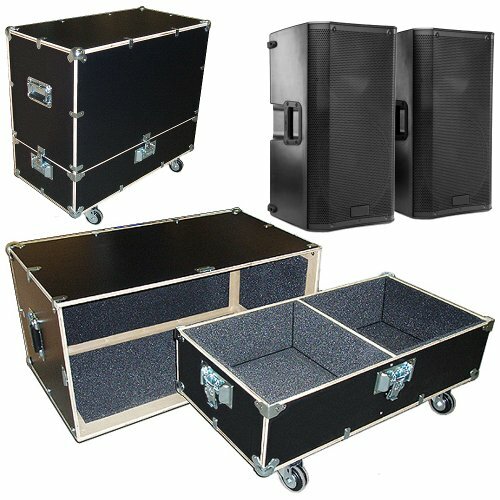 These speaker cases feature a foam lined interior, heavy duty casters, thick gauge steel plated hardware and fittings. The catches and handles insure both positive closure and easy mobility of the case. The case has a single partition in the factory assembled tray bottom of the case to keep the speakers separated and no partition in the unassembled top of the case. We find that this arrangement is sufficient and can save you money on custom case costs. These new super strong cases are shipped with the top of the case unassembled to extremely lower today's high shipping costs. All hardware is already riveted onto panels and T nut fasterers are factory installed to make these cases very strong and simple to assemble. Easy to follow pictorial instructions make assembly a snap! This new line of cases all include new heavy duty Recessed/Surface Mounted handles and catches. This new innovative hardware does not require holes in the case making the case both clean interiors and a stronger case due to no routed holes in the panels which compromise the integrity of the case. Speakers in photos not included.